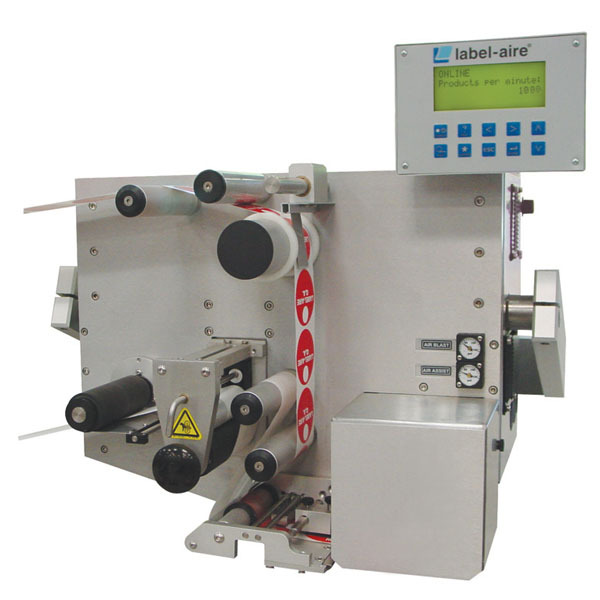 The Label-Aire 3111 HS "High Speed" label applicator can apply labels accurately up to a blistering 1,000 labels per minute. The 3111 HS utilizes Label-Aire's innovative Air-Blow technology which retains the label by vacuum on a honeycomb applicator grid. At the precise moment the product passes under the grid, the label is blown onto the product. Peel tip sensing ensures repeatable label placement accuracy. The 3111 HS also features a DC Servo which allows the unit to handle up to 5,000" (127 m) of web per minute at peak velocity. Label-Aire's 3111 HS offers added versatility in that it can be mounted in almost any position adjacent to the production line to apply labels to the tops, sides, or bottoms of products.